Please take all celebration over here. This thread is only for preparing for round two. 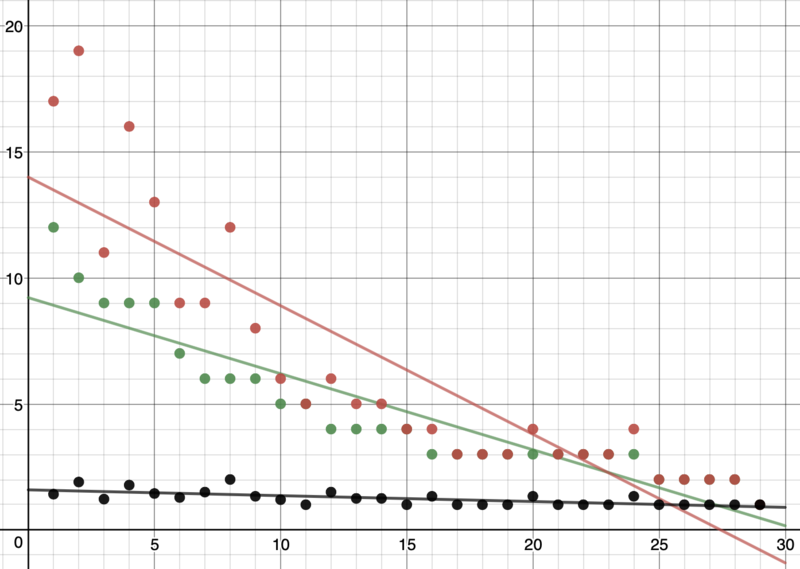 Again, the x-axis represents the day, the green plot the number of users remaining, the red plot the number of eligible answers posted, and the black plot the average number of answers per user. As mentioned in the wrap-up post, the data indicate that many users posted just one answer a day. The mindset is certainly reasonable: if the point is to stay in the competition as long as possible, then, rather than post all my answers at once, why don’t I post one each day, and I’ll last a few weeks? Particularly at the end, participants seemed to be doing this: the competition is still ongoing, and I want to stay in, so let’s just post one question each day. I propose, for round two, to have two parallel competitions going on: the main competition, which would work the same way as round one, as well as an additional group effort that anyone can join or leave at any time. While the main competition is going on, the community can work together to target other questions with less pressure. Nobody gets knocked out or otherwise penalized for missing a day: the only goal is to find answers to old questions. By removing the incentive to post just one a day, perhaps people will post more than one, though admittedly this could easily backfire. This definition avoids issues of answers which, at the time of posting, would qualify and are later disqualified, or vice versa: any answer earning a Revival is in, any answer which does not is out. It also allows self-answering, which does net you a Revival. This does come with a problem of its own: Revival is actually awarded to the oldest answer with a score of at least 2 instead of the first such answer. To address this issue, I propose that any questions eligible need to have no nonnegative answers (yes Isaac, I’ll let you have this one). As before, I'd like to hear your thoughts on this. Suggestions? Improvements? Critiques? Telling me to my face that this is a terrible idea? Given how long it's been since most people were in the competition (the last time five or more people were in the competition was over three weeks ago), is the community ready to jump right back into it? Should we wait a bit? Rosh Chodesh is March 8, two weeks away. At that point PTIJ season starts up again... Should we jump back into it, with the added rule of excluding reopened PTIJ posts, should we wait a bit and run both seasons simultaneously, or should we wait a month and start up again on March 24, immediately following PTIJ? In terms of timing, I propose starting a new Answerathon on every first day of Bahab (beginning Marcheshvan 5780). We don't want them too often or they lose their uniqueness. Bahab comes after months of major activity (Elul/Tishrei and Adar/Nissan) and can be a way to spice up the upcoming doldrums. While some participants may have been eliminated from the contest due to extenuating circumstances (e.g. a day without much internet access, or a very busy day with no time to answer questions) it is reasonable to assume that as the contest went on people were finding fewer questions that they could answer. If someone dropped out of the contest because they had no further questions to answer, a new contest starting so soon will not be of much use. The new contest would be covering more or less the same set of questions that the person had just given up on. By waiting a while until the next contest we allow for a new pool of unanswered questions to build up. This way when the new contest begins it is more likely that various people will be able to contribute, which might not be the case if we start a new contest sooner.